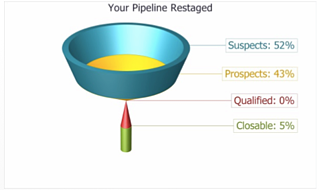 You have validity and complete confidence in the credibility of your pipeline report. Your CFO never asks you about solid sales forecasts. You are ok with the unpredictable ups and downs in your team’s production. How many new leads are we really generating? How many of those new leads are converting to new opportunities AND what is that conversion rate? What is our real average size account? What is our closing ratio from new opportunities to closed /won accounts? What is the dollar volume or number of new opportunities on a rolling 90 day time frame throughout the year? Knowing the answers to these questions helps you have better predictability from your pipeline. The answers also helps you develop a more intentional coaching strategy; one that allows you the intelligence to coach your sales people on their specific choke points. Instead of telling them they need to “See more people”, “Do a better job of closing” or “Increase your average size sale”, you will have the ability to show the data so that they understand where they are lacking and must increase efforts and/or learn skills. Here are 5 Sales Management BEST PRACTICES to eradicate the rollercoaster anemic pipeline problem, ALTHOUGH you must have a CRM system that does more than just allow your sales people to enter data about leads. You have established for each sales person on your team a “Success Formula”. You can go to this link to download a template. The individual Success Formulas puts you and your sales people on the same page which outlines effort and effectiveness required to meet and exceed extraordinary goals. You have a Huddle Process to collect real time information on effort. The entire sales process hinges on one step – effort to generate leads. It is nothing more than effort. While skill is required, true effort in the form of necessary behavior is critical . S. If you don’t have true “hunters”, recruit and replace. Establish coaching plans for those failing (even just 5% off of target requires coaching). Each coaching session must end with an action step: eg. “Mike, what I want you to do now is to call ABC Company and talk to your contact. Have the discussion we just role–played and report back to me by the end of business tomorrow.” Without action steps your sales people will leave these 1-on-1 coaching sessions and promptly forget the discussions. Unfortunately by next week you will be wondering what they did differently, if anything at all. These 5 Best Practices are not meant to be the all-inclusive list of steps required by sales managers to drive sales productivity. You must still have steps and strategies to motivate your people, recruit more of the right talent, have great sales meetings, develop teams that work together etc. But focusing on these 5 Best Practices will help you develop a more credible, valid and consistent pipeline. This is important to you, your people and the company. 9 Keys to Coaching Sales Success Are you a great coach?